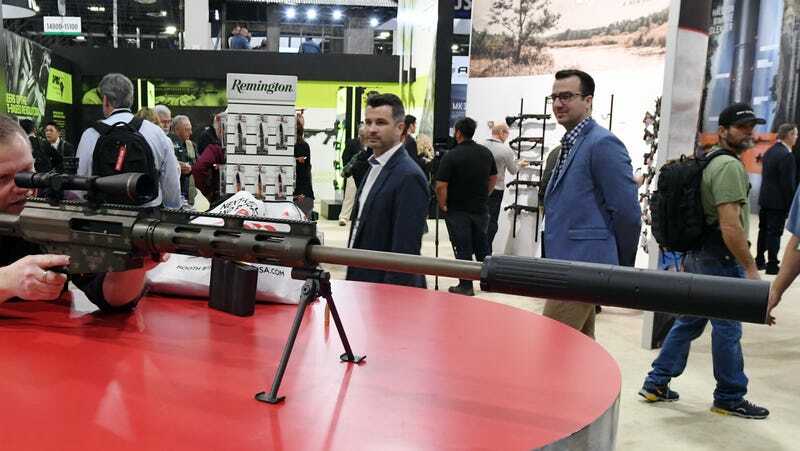 A man looks at a Bushmaster BA-50 bolt-action rifle at the Remington booth at the 2018 National Shooting Sports Foundation’s Shooting, Hunting, Outdoor Trade Show at the Sands Expo and Convention Center on Jan. 23, 2018, in Las Vegas. After more than two centuries of providing America with classics like the AR-15-style assault weapon used to mow down 20 first-graders at Sandy Hook Elementary in Newtown, Conn.; the pump-action shotgun used to kill 12 people in an Aurora, Colo., movie theater; and the .223 semi-automatic rifle used to kill 14 people in San Bernardino, Calif., the gun manufacturer Remington has filed for Chapter 11 bankruptcy. Although the company announced the decision in February, the Wall Street Journal reports that the Remington Outdoor Co. delayed the filing until this past Sunday, after the mass shooting at Marjory Douglas Stoneman High School in Parkland, Fla. I’m sure that as one of America’s oldest gun manufacturers, it didn’t want the negative publicity. Equity firm Cerberus Capital Management LP acquired the 202-year-old company in 2007 for $118 million after acquiring a number of other firearm manufacturers, including the maker of one of the deadliest assault-style weapons, the Bushmaster AR-15. Given the response during Barack Obama’s presidency, the firearms industry predicted that the election of Hillary Clinton would fuel another gun-buying boom. After Obama was elected, gunmakers capitalized on fears that his thugs would kick in their doors and confiscate their weapons, fueling a $29 billion surge in sales, more than during any previous presidency. Meanwhile, the confiscation never happened. In 2016, Remington created a special bicentennial anniversary line of guns, pledging up to $50,000 to the National Rifle Association from the sales. The NRA lists Remington within its “Ring of Freedom” as one of its corporate partners. The bankruptcy plan allows Remington to restructure its financing and settle its debt from $100 million in loans. The Madison, N.C., company plans to keep making guns and ammunition while under bankruptcy protection. Hopefully Killer Mike’s infomercial on NRATV will help.